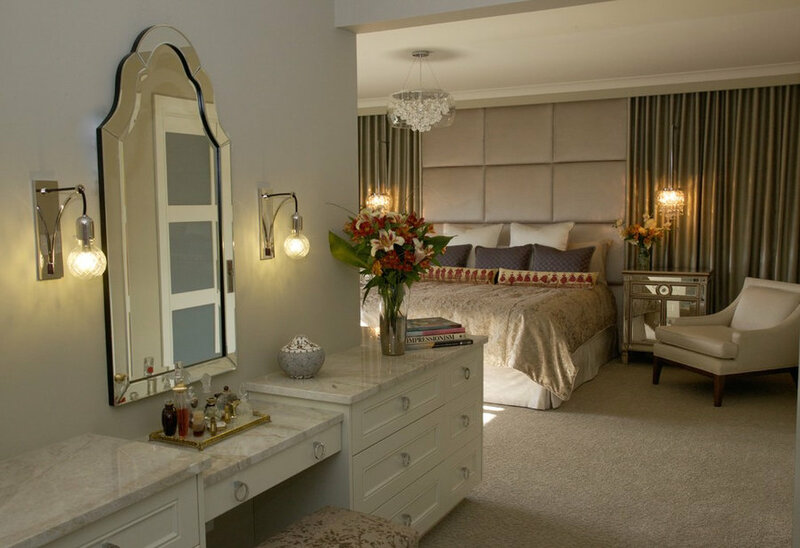 This project transformed a drab bedroom into a Hollywood Glam master ensuite with open planned dressing room and a stunning new bathroom! Check out the before pic to see the transition. Tone on tone plays of texture bring a rich warmth to the space. 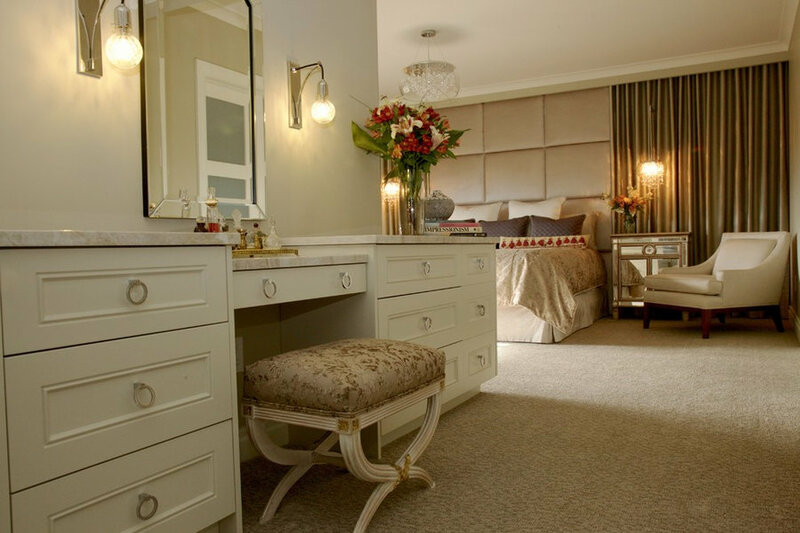 A luxurious master bedroom you would never want to leave! A touch of old world Hollywood Glam brings this space to life. 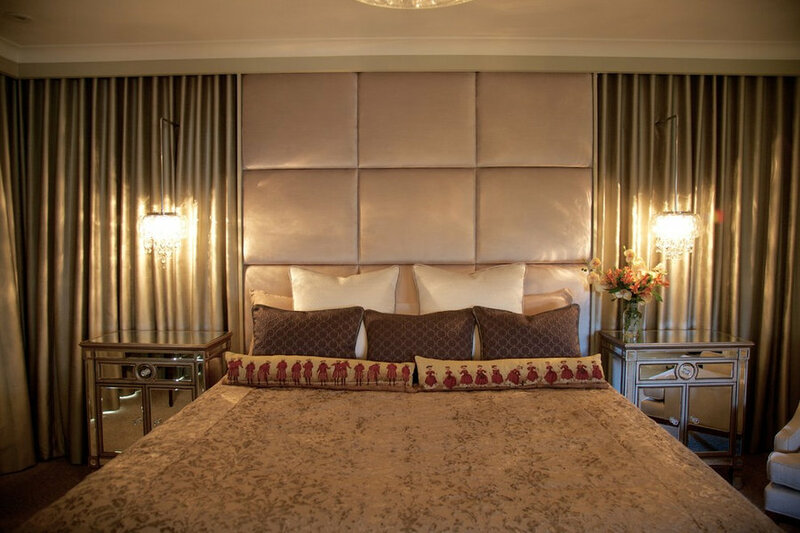 Elegant drapery covers the walls creating a luxurious cocoon in which to relax. 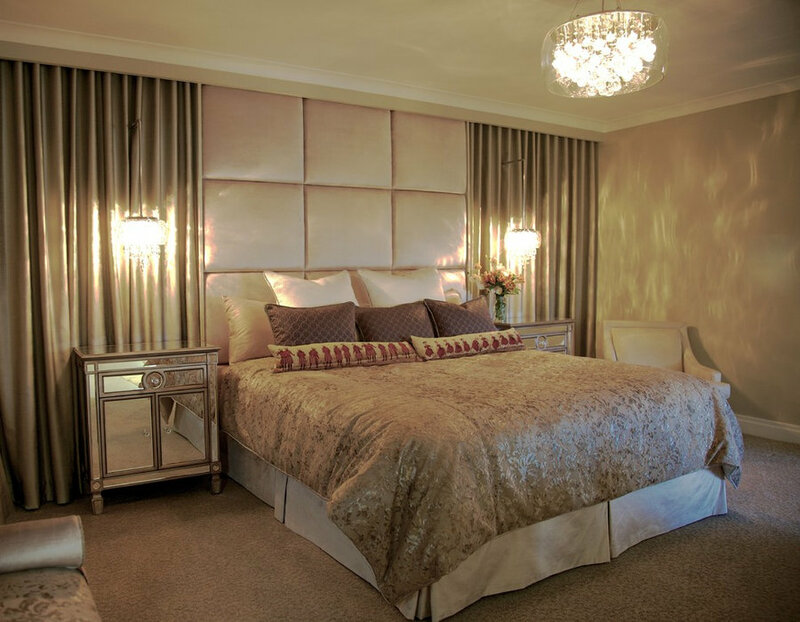 The full length headboard creates an easy elegance. 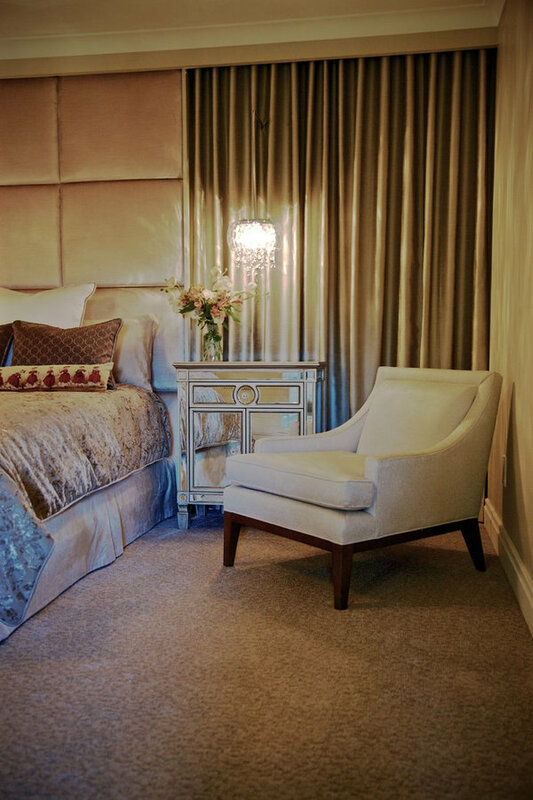 Drapery along the walls adds glamour, visual texture and warmth. All on a budget. 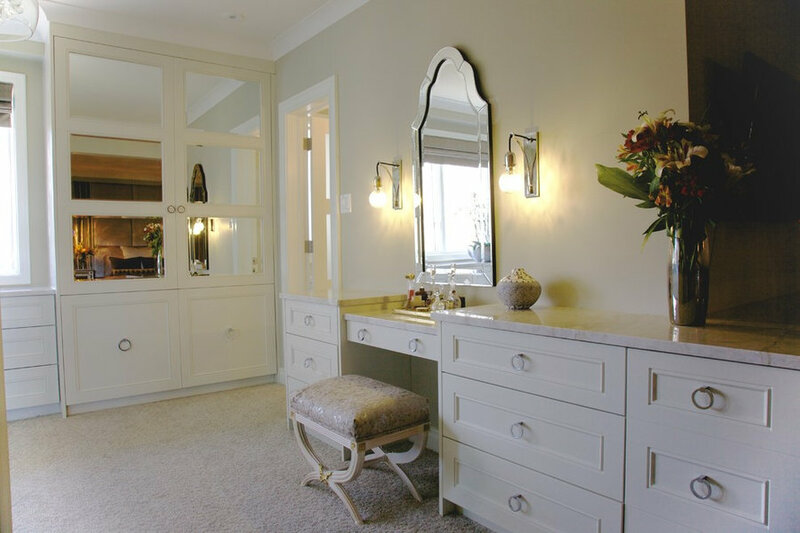 Custom millwork which wraps around the corner unifies the spaces making the dressing area part of the bedroom. Now the client has a view to the back yard! We found a vintage bench in a second hand shop covered in yellow chintz with pink velvet polka dots, and gave it new life! This damask with a metallic thread brings new life to a traditional pattern with a zing of glamour to catch the eye. 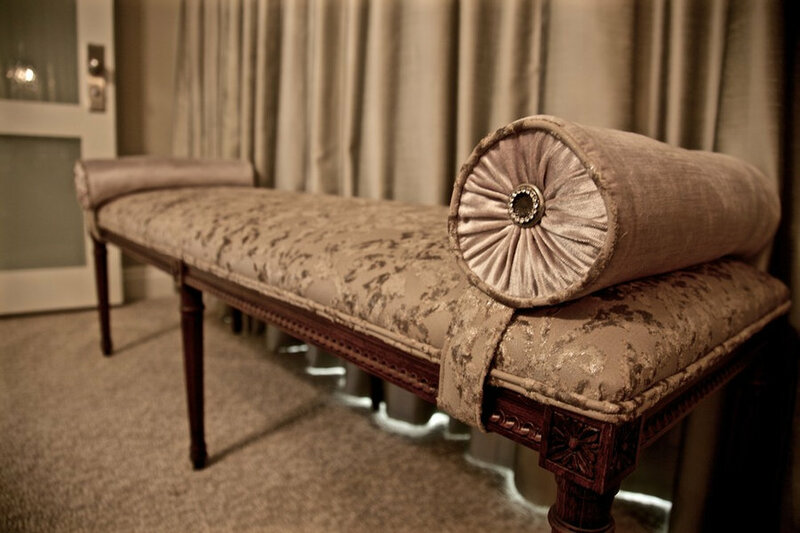 Bolster pillows with vintage crystal buttons are attached to the underside of the bench to keep them in place. 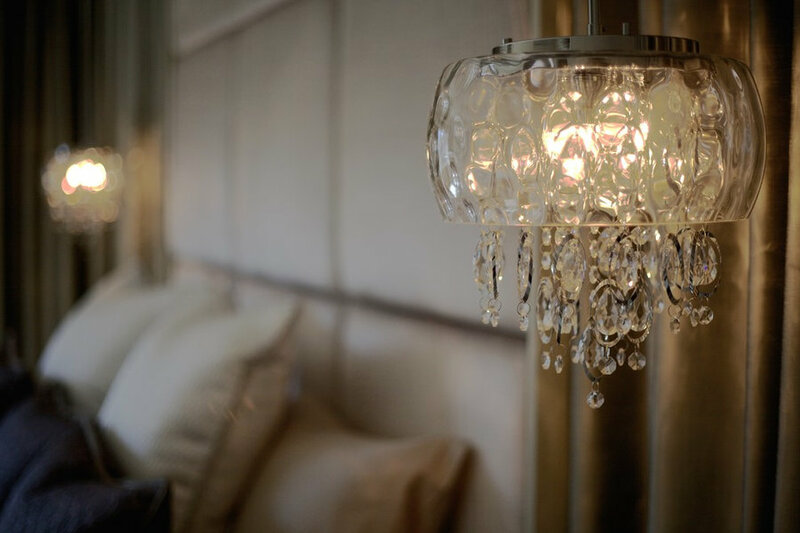 Even the crystal tear drop pendant chandeliers create interest and texture in the shadows and light they cast. 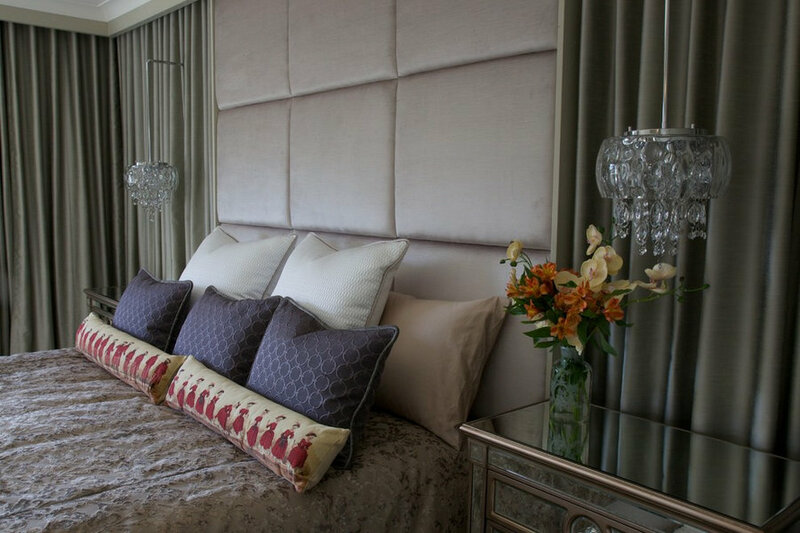 The upholstered velvet headboard is also a form of sound proofing. Everything was designed around these fabulous embroidered pillows the clients brought home from their travels. They were the pop of colour! Custom cabinetry allows you to have all the storage you need, where you want it. Disguised as drawers in the lower right is a pull out laundry hamper! By removing the wall to the adjoining bedroom, this is now a sun filled ensuite dressing room and the client can now see the back yard from bed! What an elegant way to begin and end the day! 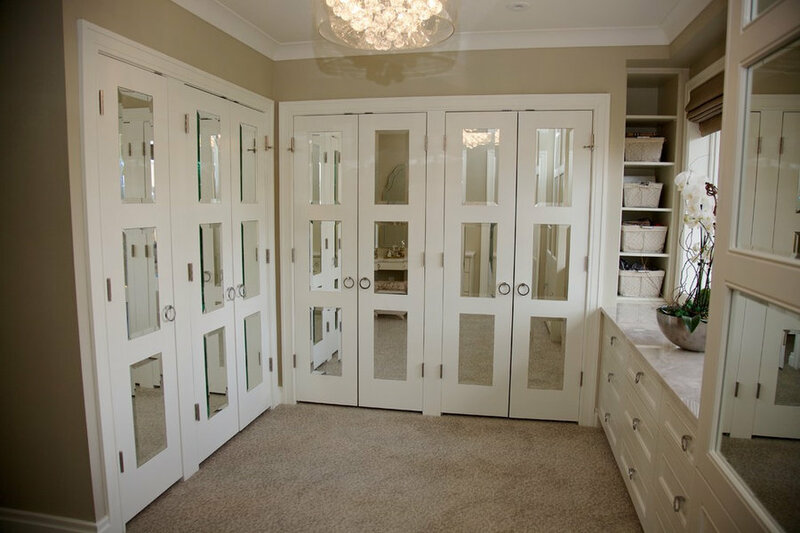 Beveled mirrors set into the shaker cupboard doors bounces the light into the room and adds sparkle. Integrating a number of different types of storage accommodates a space for everything. That is how order is achieved. Natural light from the back yard can now be appreciated from the clients' bed. Being connected to natural light is an important key in boosting moods. What do you do when you want a window but it's not in the budget? Create one! This lit niche provides depth, indirect light, and the perfect backdrop for small art pieces or candles. 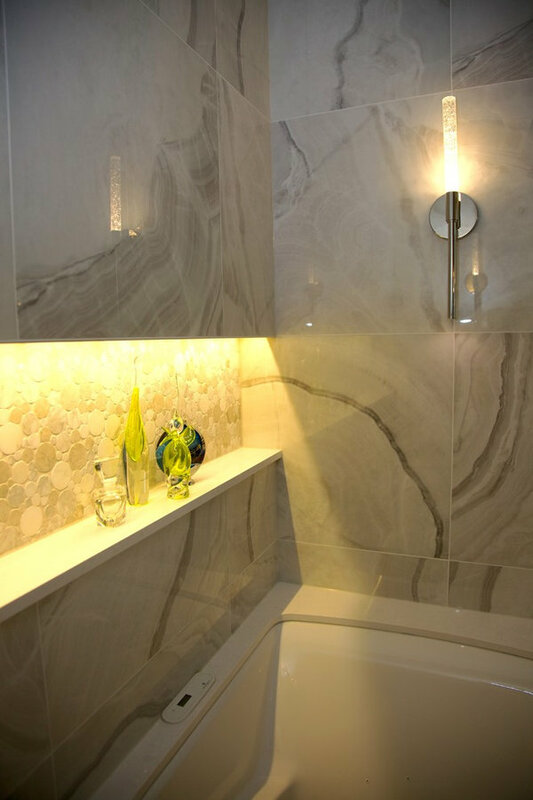 The variation of lighting is the key to making a space special. It makes a small space sparkle and pop. The client wanted to be connected to light. Without a window in this space we created a lit niche to give depth. 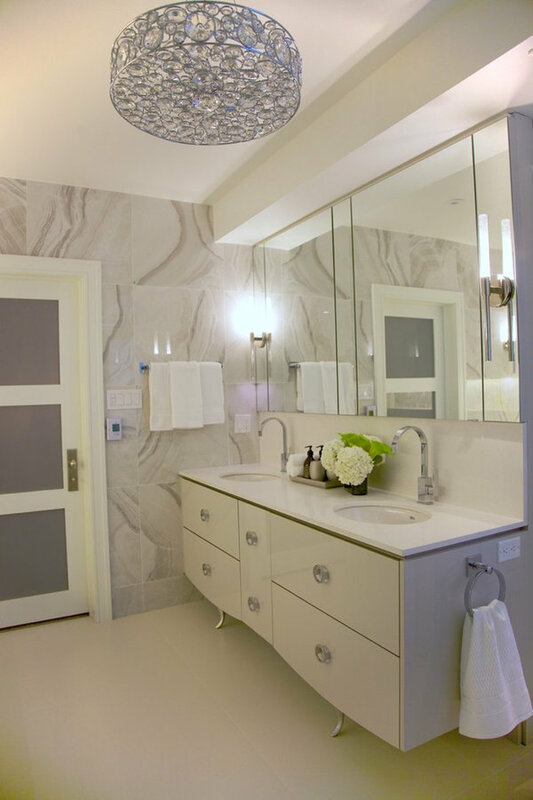 This stunning marble bubble tile is repeated in the shower floor. 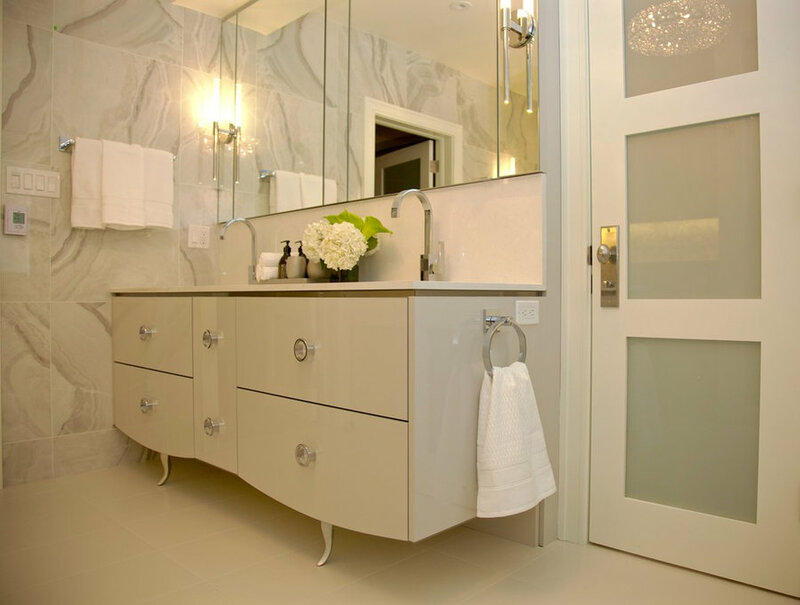 The soft scallop front and feminine foot at the bottom of this custom vanity references the old style of Hollywood elegance. It almost looks like a piece of furniture from Beauty and The Beast! Suspending the vanity gives visual breathing space. Deep drawers provide plentiful storage. 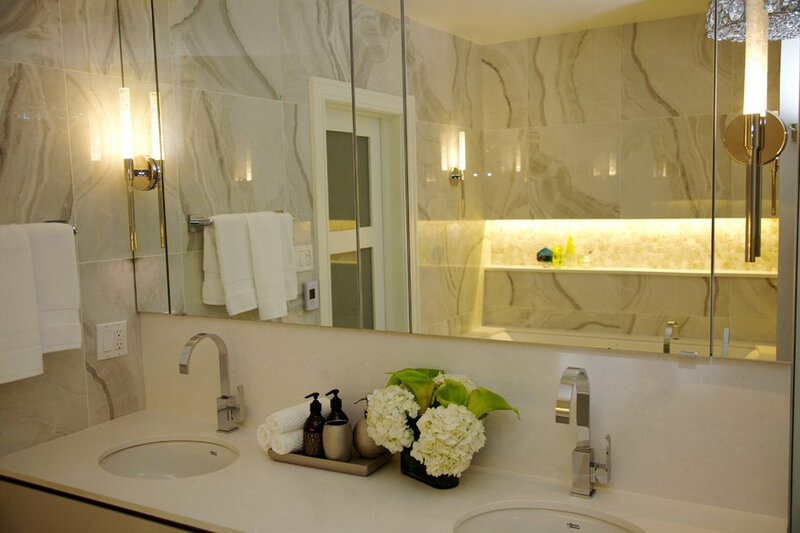 Sconces on mirrors amplifies the lighting. This is a magnificent crisp, clean oasis in soft greys and white. Running all plumbing off the same wall saves money. 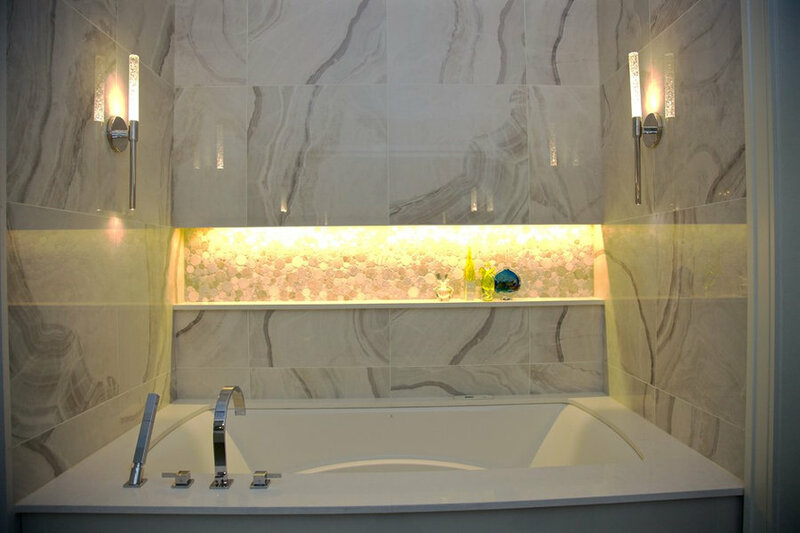 The marble bubble mosaic tile in the niche above the tub is repeated on the shower floor. Tone on tone texture is so soothing. 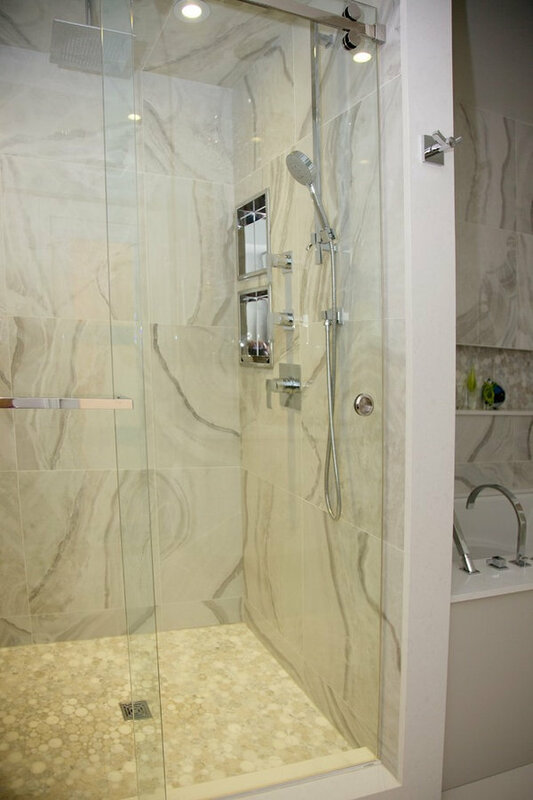 Inset chrome niches provide shelving in the shower. Rolling barn door hardware on the glass doors means no door swing! Great for tight spaces.